The telegraph made it possible to communicate with citizens all across our growing nation. The first transcontinental telegraph followed the overland route used by many emigrant trails. This includes the California trail, which you can learn all about when you visit the California Trail Interpretive Center in Elko, NV. How could messages be sent across instantly before the internet was invented? They were posted by telegraph. Telegraph is an electrical current sent along a wire with a coded message. Samuel F. B. Morse invented not only the technology but also a code known today as Morse code. In Morse code, a letter of the alphabet has its own unique sequence of dots and dashes. A telegraph operator tapped these out and sent them along the wire. These messages could be sent anywhere there was a connection, almost instantly. There were many complications in setting up telegraph wires across the continental United States. The rugged mountains and terrain of the west was a challenge for workers to navigate. Many emigrants already knew this, as they had been traveling the same California and Oregon trails for several years by then. Wood for poles was also sparse, which meant it had to be shipped in from other areas and moved along the telegraph line as it grew. After that, there was no more trouble from native peoples trying to sabotage telegraph building work. There are many fascinating stories and facts associated with the first transcontinental telegraph. Samuel F. B. Morse was also an art professor. The Western Union Company installed the telegraph line. Congress approved the transcontinental telegraph in 1860. The eastern and western networks connected in Salt Lake City, UT. It cost $40,000 to join the two lines. The first transcontinental telegraph message was sent on October 24th, 1861 from Chief Justice Stephen J. Field in San Francisco to President Abraham Lincoln in Washington D.C. This new method of communication meant that the Pony Express, which carried fast messages along the California Trail and other routes was now obsolete. It ceased operations just two days later. Advances in technology mean we’re always saying goodbye to something old and welcoming in something new. 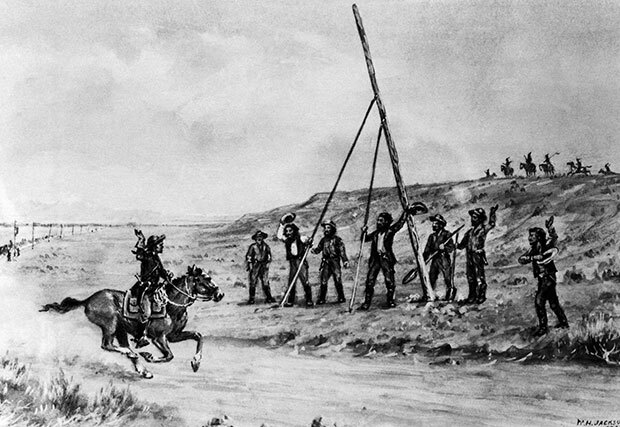 The California Trail was a useful route for the first transcontinental telegraph. Plan your visit to the California Trail Interpretive Center today and learn more about the importance of the trail in the history of the United States. Our center has interactive exhibits and special events. We can’t wait to share with you the wonder of the trail and the people who traveled its path. Southern Nevada Conservancy, a 501c3 nonprofit organization based in Las Vegas, NV, works cooperatively with the Bureau of Land Management through a formal agreement to provide education, informational, and other public services that will add to visitors understanding and enjoyment of the California Trail Interpretive Center. These programs include California Trail Interpretive Center programs, interpretive programming, volunteer management, retail operations, social media outreach, and this website. The California Trail Interpretive Center is open year round, Wednesday thru Sunday from 9:00 AM – 4:30 pm. The center is closed Thanksgiving Day, Christmas Day, and New Year’s Day. RV & Bus Parking is available.